Over 40 % of primary energy use and 24 % of greenhouse gas emissions are attributed to global energy use in buildings so architects and builders are being posed the challenge of creating highly energy-efficient structures. One vision promoted by stakeholders in many countries worldwide is Net Zero Energy Buildings (NetZEBs). To provide an analysis of the market potential and the actions required for a market uptake of this architectural design approach, the IEA Solar Heating and Cooling Programme published a position paper entitled SHC Net Zero Energy Solar Buildings in June. The 10-page summary is based on the insights of 82 experts from 19 countries, who have been conducting research within a joint IEA SHC Task 40 and Annex 52 of the Energy in Buildings and Communities Programme (EBCP) over several years (see the attached document). The photos show three French NetZEBs: a university research building on the tropical Island of La Reunion, an office building in Paris and a school in the city of Poitou-Charentes. Make building design as energy-efficient as possible, including energy harvesting by passive solutions. Use energy-saving systems and services for appliances, lighting, heating and ventilation. Produce as much renewable energy onsite as possible. Designers need successful case studies to be encouraged to accept the challenge of this ambitious building standard. Hence, the research network of Task 40/Annex 52 published a technical report with 30 fully documented NetZEBs in cold, hot and tropical climate zones in May 2014 (see the attached document). Creating a NetZEB is a complex job, considering the design of the building`s envelope and future operation – two aspects which are often considered individually today. According to the position paper, it needs more technological advancements, such as the development of efficient building automation systems, as well as small but optimally controlled heating and ventilation units. Software tools should additionally support builders in balancing energy demand, investment costs and renewable onsite production. The SHC Task 40/EBC Annex 42 group developed an Excel-based software that enables energy balance, operating cost and load match index calculation for predefined selected definitions and is available online. All publications, including a book Modelling, Design, and Optimization of Net Zero Energy Buildings published in March 2015, are listed on a subpage of the TASK 40 website. 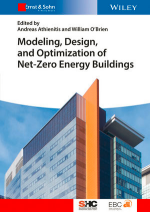 The aforementioned book, for example, has accomplished international experts presenting advanced modelling techniques, as well as in-depth case studies in order to help designers get the most out of simulation tools for net zero-energy building design.